I managed to get some sewing done late this afternoon, at last. It's not brilliant, but it's finished, it's made of scraps and it's blue, so I'm just in time to join in with the links at the Rainbow Scrap Challenge. I followed a link on Angela's blog to Mad4Patchwork, and from there I followed another link to Handmade Harbour where I found the pattern for this scissor holder. 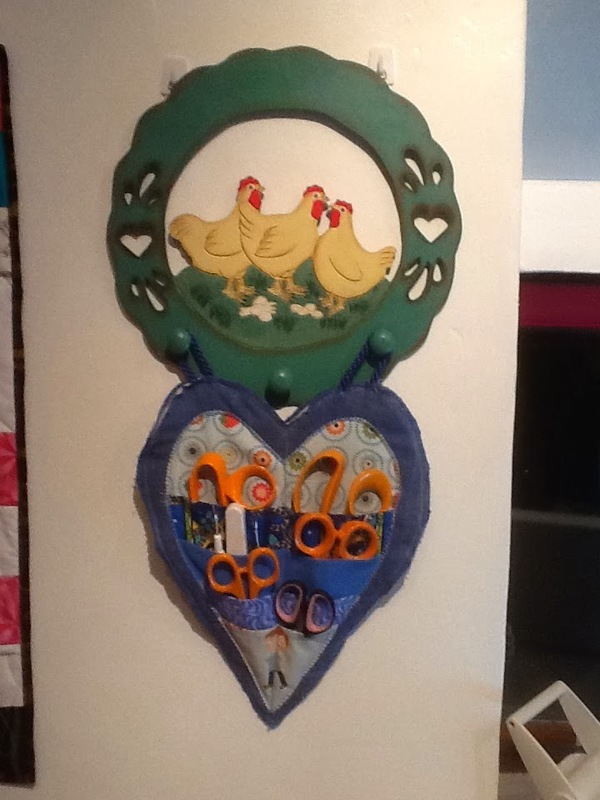 I bought the hen hook holder in an antiques market years ago and have never found a real use for it; it hangs right close to my sewing machine so is a perfect place to hang the scissor holder. Well how handy is that? I should think about things like this instead of always looking for blocks to make. Oh Wow! I love it! It's the perfect way to hang your scissors and it looks like wall art. What a useful little holder to have near the machine. Looks lovely in blue. Your scissor holder turned out great. I only got as far as printing out the tute! What a clever idea! I love the scissor holder. You are always so creative. I like the scissors holder. It's a good way of using scraps. I must check that pattern. I stumbled across your lovely blog on the quilting blog website and so glad I did. Happy new year from a new follower.